It's that time of the week. Think about anything except the markets or the economy. I'll be back on Monday. The general trend of hours worked is down. 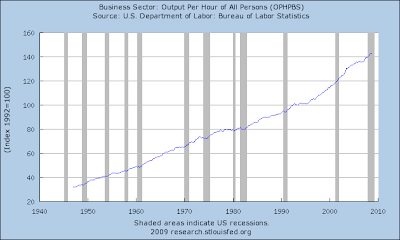 From 1964 to 2008, total hours worked/week has decreased from 38.6 to 33.5 (roughly). Real weekly wages decreased from 1972 to 1996 and increased slightly after that. However, real average weekly wages are still below their 1964 level in 2008. Let's add two more charts to the mix. I wasn't sure if these graphs overlap in their data sources. But, considering both are increasing it's a bit moot. 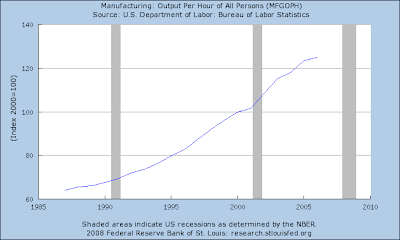 Here's the bottom line: hours are decreasing as are wages on an inflation-adjusted basis but productivity is increase. In other words, we're doing more for less. New orders for manufactured durable goods in March decreased $1.3 billion or 0.8 percent to $161.2 billion, the U.S. Census Bureau announced today. This was the seventh decrease in the last eight months and followed a 2.1 percent February increase. Excluding transportation, new orders decreased 0.6 percent. Excluding defense, new orders also decreased 0.6 percent. Orders for U.S.-made durable goods fell less than forecast in March, adding to signs the economic slump is easing. The 0.8 percent decrease reported by the Commerce Department today in Washington compares with an anticipated 1.5 percent drop, according to the median of 68 estimates in a Bloomberg News survey of economists. The news was tempered by revisions to February figures that showed a 2.1 percent gain in orders, smaller than the government previously reported. Economists project any economic recovery in the second half of the year may be muted as government measures to revive growth will take time to gain traction. General Motors Corp. is planning on idling 13 plants for multiple weeks from May through July, and other companies may keep cutting spending and slash jobs until demand here and abroad shows sustained gains. Does anyone see a trend? I know it's hard, especially with that really long DOWNWARD SLOPING TREND LINE but just try and make a guess about what's going on. Of course, the report also said "This was the seventh decrease in 8 months" which would also indicate maybe there's a downward trend in place. Of course, the fact that new orders are down 27% for the year to date relative to last year to date might also indicate there's a problem. But no -- we beat economist's expectations. So the sun is shining. Actually, I think this will wind up being a multi-prong set of articles because the answer will probably evolve over time. Over the last few weeks there have been calls of a bottom in the economy, or green shoots or signs of hope or whatever. The central message has been things are getting better -- or at least declining at a less severe rate. I have been extremely reluctant to make that call for several reasons. First, the data is at best preliminary and therefore subject to revision in either direction. Second, it's only a few months worth of data at best. In general, the best that can be said of any of the this new information is it is running against a compelling downward sloping trend. That being said, in recent conversations I've had about the economy two points have come out -- two points that I think must be conclusively resolved before I am comfortable saying we're through the worst. 1.) 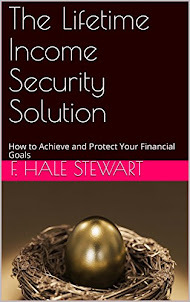 The problems in the financial system have to be resolved. This will take some time. Under the Geitner plan a bank that gets a poor grade on the stress test will have 6 months to find new capital or get a government injection of cash. The underlying idea here is the bank will try and sell itself during that time if it is possible. However, it still leaves us with a six month period during which the situation will be unresolved. 2.) The auto situation must be resolved as well one way or the other. Frankly, I don't think the US economy could withstand an auto bankruptcy right now. There are so many industries that feed into the auto industry and provide ancillary services that a bankruptcy would threaten a fairly wide swath of the economy and send any recovery into a tailspin. We have to come out of this with a sense of "we're totally out of the woods" before we can say we're coming out of a bottom. The weekly charts shows the dollar made a double top with the first top occurring at the end of last year and the second top occurring at the end to the first quarter of this year. 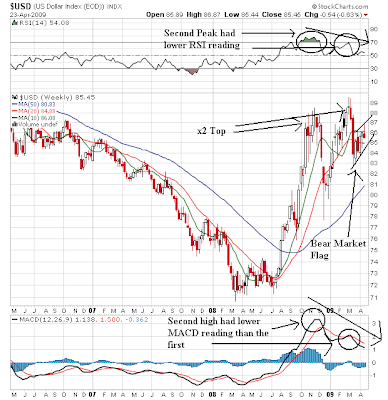 However, also note the second top had a lower RSI and MACD reading making it suspect. 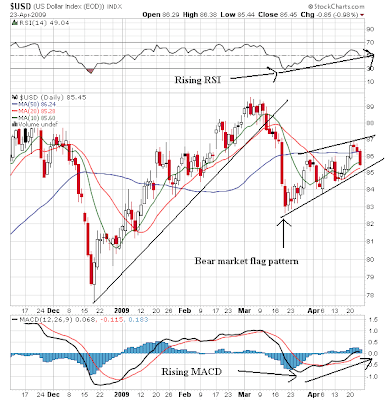 The dollar has since sold off but is currently in a bear market flag pattern. Finally, notice that prices and the 10 and 20 week SMA are in a tight formation indicating a lack of overall direction. The above chart shows more clearly the trend break from the second top and the current bear market pennant pattern. While the MACD and the RSI are rising, notice that prices haven't jumped higher in one direction or the other. Instead, they're in a tightly contained pattern. Also note that prices are the SMAs are in a tight pattern indicating an overall lack of direction. 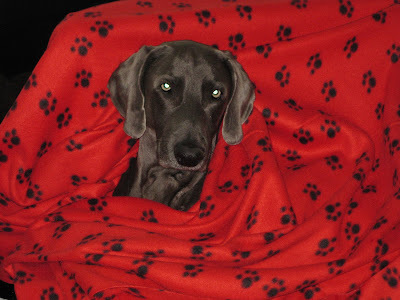 A note on yesterday's charts: I was out for the afternoon. When I got back to the office I forgot to refill the background on several charts before I saved them for the blog. Sometimes things get moving a bit too fast. With all of the charts below note the bullish alignment of all the SMAs -- the shorter SMAs are above the longer SMAs and in most cases the SMAs are moving higher. However, also notice that all the averages have broken the upward sloping trend lines and in some cases are grappling with trying to maintain their position. In the case of the SPYs and DIA, notice that prices are started to form a downward sloping consolidation pattern or bull market sell-off. 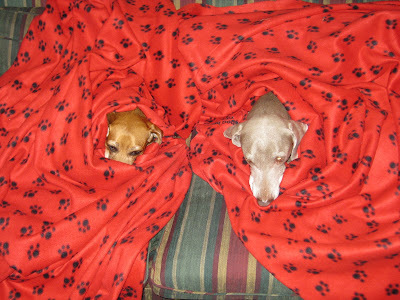 Both look as though they are ready to "roll over" -- start to move lower at a considerably faster pace. While the headlines implied these were good numbers, I just don't see it. Unemployment ticked up and existing home sales are still at low levels. It's way too early with both of these data series to tell whether or not they have topped/bottomed out; we just don't have enough data. An argument could be made that maybe existing homes sales have bottomed. But you could have made that argument over all of last year and you would have been wrong. How Does the Transport Average Stack Up to Current Price Action? United Parcel Service Inc., the world’s largest package-delivery company, posted a profit that trailed estimates and forecast second-quarter earnings short of analysts’ projections as the recession curbs shipping. First-quarter net income fell 56 percent to $401 million, or 40 cents a share, the company said today. Excluding non-cash costs to write down the value of UPS’s 40-year-old fleet of DC-8 jets, profit was 52 cents a share, trailing the 56-cent average of 16 analyst estimates compiled by Bloomberg. UPS is considered a bellwether for economic health because it handles business and consumer packages worldwide. It said profit this quarter would be 45 cents to 55 cents a share, less than the 66-cent average among analysts surveyed by Bloomberg. “Economic indicators tell us recovery in the U.S. might begin late this year, but more likely not until 2010,” Chief Financial Officer Kurt Kuehn said in a statement. Sales slid 14 percent to $10.9 billion, only the second quarterly drop since Atlanta-based UPS first sold shares to the public in 1999. The above chart caught my interest because prices are still below an important trend line. While the SMAs are in a pretty bullish configuration (shorter about longer, two of the shorters moving higher and the longer one moving sideways), prices are still below an important trend line. The MACD is a bit over-extended at these levels. The three months chart shows two very important technical points. 1.) The upward sloping trend line that started at the beginning of March is now resistance as opposed to support. 2.) Prices have approached the downward sloping trend line twice only to be rebuffed. If this chart is going to move higher it needs to do so soon. Today I'm going to look at government spending and GDP so see what the numbers tell us. All of the numbers are in chained 2000 dollars. As always, click on all images for a larger image. 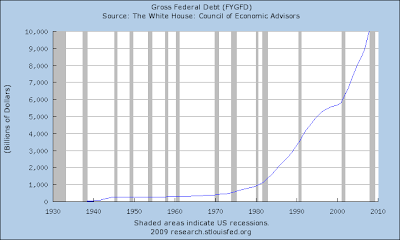 Let's look at a chart of all government spending as a percentage of chained GDP. 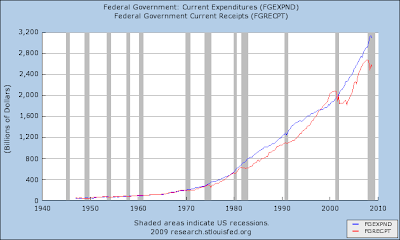 Notice the total government spending as a percentage of chained 2000 GDP has fluctuated between 17.4% and 18.4%. Whether this is good or bad is a matter of opinion and -- more importantly -- political ideology. The BEA breaks down federal spending into defense and non-defense spending. Above is achart of defense and non-defense spending in chained 2000 dollars. Notice that defense spending is roughly twice as large as non-defense spending. Finally, we have a chart of defense spending as a percentage of federal spending in chained 2000 dollars. Bottom line: defense spending comprises the bulk of federal spending. First, an update on yesterday's "Today's Market" post. For reasons unknown to me, my daily charts did not fill in the late in the day price action. As a result, my IWM and QQQQ chart were inaccurate. I will check to see what caused this and am sorry for any confusion. The weekly chart shows that prices dropped hard at the end of last year. Then they consolidated the losses for the first three or so months. Prices then broke out of the triangle consolidation pattern. Note that before this happened there was a rising MACD and RSI. However, prices have since fallen back to the 10 week SMA, although the RSI and MACD are still in a bullish configuration. The daily chart shows the action in more detail. Prices rallied from the middle of February to the end of March but have since moved sideways. 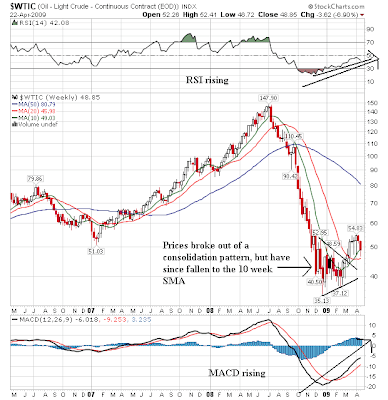 However, notice the MACD and RSI have printed a lower number on the second price peak in the consolidation pattern, indicating a weakening of the trend. Also note the prices and the SMAs are in a tight pattern indicating a lack of direction in the overall market. Let's break this down into a tale of two sets of charts. Both the QQQQs and the IWMs had strong days. Both moved through the previously broken upward sloping trend line. I drew a second line on the IWM chart to show an alternate perspective. Both charts have very positive SMA pictures -- the shorter SMAs are above the longer SMAs, the SMAs are rising (with the exception of the IWMs 50 day SMA) and now the prices are above all the SMAs. Both the SPYs and the DIAs are still below their upward sloping trend lines. And the SPYs action today is simply horrible. What's interesting is the more aggressive indexes -- the QQQQs and the IWMs are moving higher on strong bars while the SPYs and the DIAs are languishing. U.S. home prices rose 0.7 percent in February from January, the first consecutive monthly gain in two years, a sign that low interest rates may be moderating declines in real estate values. Prices fell 6.5 percent in February from a year earlier, the second-smallest drop in six months, led by a 19 percent decrease in the region that includes California, the most populous U.S. state, the Federal Housing Finance Agency in Washington said today. The gain in February from a month earlier matched the average of 10 estimates in a Bloomberg survey. Mortgage rates have tumbled 1.6 percentage points in six months, making houses and condominiums more affordable. The Mortgage Bankers Association’s index of applications to purchase a home or refinance a loan increased 5.3 percent last week as Americans took advantage of interest rates near record lows. Home sales rose 5.1 percent in February from a month earlier, the National Association of Realtors said March 23. “As demand firms, and once inventories of houses and a broad range of goods are brought into line with sales, economic activity should begin to stabilize,” Federal Reserve Vice Chairman Donald Kohn said in an April 20 speech in Delaware. The inventory of properties on the market fell to a 9.7 month supply in February at the current sales pace, down from April’s high of 11.3 months, and sales rose 5.1 percent from a month earlier, the Realtors group said. Personally, I prefer the Case Shiller model. However, this is good news. BUT, take it with a grain of salt. First, sales are rising from very low levels. Secondly, this is only two months of data; the primary trend is still down. When we get a few more months under our belt, then I'll be happy. There are two other charts that stand out from a look at US exports and imports. Notice the exported goods continued to increase in the latter half of the latest expansion -- especially when imported goods started to drop. The US is a net importer -- meaning we import more than we export. Therefore, this sub-category of GDP subtracts from overall economic growth. The reason is simple: when a country imports more than it exports it sends more money overseas from trade than it receives from the goods it sells. Therefore, there is a new outflow of funds as the result of trade. This chart tells us some important information. First, the US exports about twice as many goods as services. In addition, until the first quarter of this year, real exports were increasing at a strong rate as were services. In other words, the US wasn't the laggard it is often portrayed as in the press. 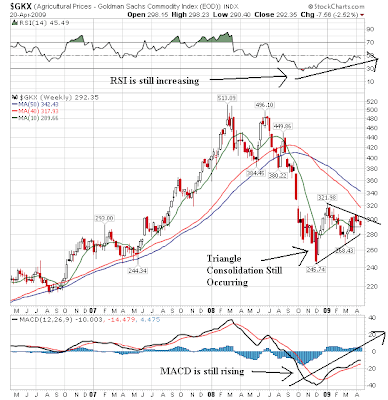 The industrial metals market broke out of a triangle consolidation pattern a few weeks ago and has been rallying ever since. While it is currently pulling back that is to be expected after a strong run. In addition, traders are probably questioning a bit their decision to bid up prices in the face of an economy that isn't really going anywhere just yet. However, the MACD and RSI are still rising and the 10 week SMA is positive. 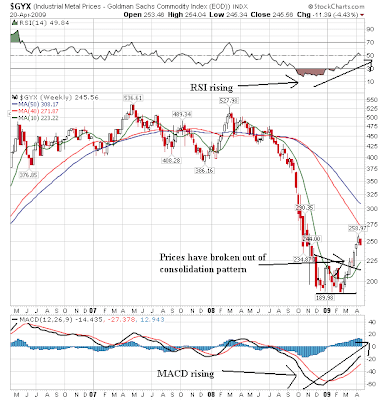 Agricultural prices are still bottoming in a triangle formation. Prices are still tangled with the 10 week SMA and are below the 20 and 50 week SMA. In addition, the MACD are RSI are still rising, although the RSI is a bit weak. Today all the markets bounced back to some degree. The IWMs moved above their previous trend line, the QQQQs are right a their trend line and the DIAs and SPYs are still below all their trend lines. All the averages are also using their respective 10 and 20 day SMAs as support and resistance. Pay particular attention to the DIA chart -- it is the closest to "rolling over" with the SPYs a close second. All of the charts still have a bullish SMA orientation -- the shorter SMAs are above the longer SMAs and and most of the SMAs are moving higher. 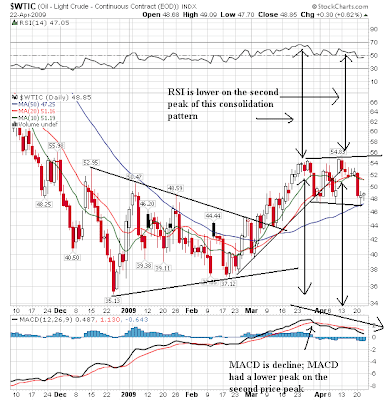 Below all of the charts I've included a second set of charts that shows the MACD. Note that all four charts have an MACD that is overbought and about to give a sell signal. I still think we're moving into a correction period for the next few weeks. There are simply too many wild cards out there still. Finally, let's take a look at Equipment and Software investment. On a real basis, total equipment and software investment has stood between $819 billion and $1.09 trillion over the last expansion. In other words, it's been a fairly constant value in absolute terms. Also note that as a percentage of GDP E and S investment has been pretty constant as well, varying at the most by 1.5% throughout the expansion. E and S investment stopped in the second quarter of 2006 and has been increasing at mostly slow increments since then. There were two quarters (2Q and 3Q 2007) when there was a nice spike up, but aside from those two quarters the net increase has been pretty subdued. Finally, notice that in the last quarter there was a huge drop from the previous quarter in overall real investment. That is not a good sign.